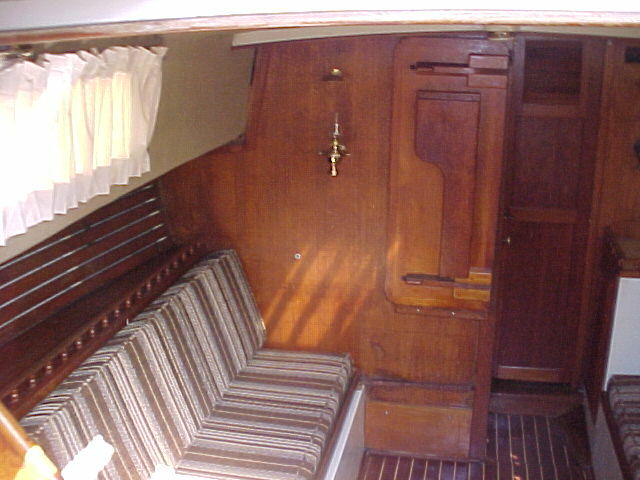 The side deck sections along the cabin area have clear spans with no bulkheads or built-in cabinets to give support to the underside of the side decks. These deck areas always flexed, a condition that was attributed to lack of support. 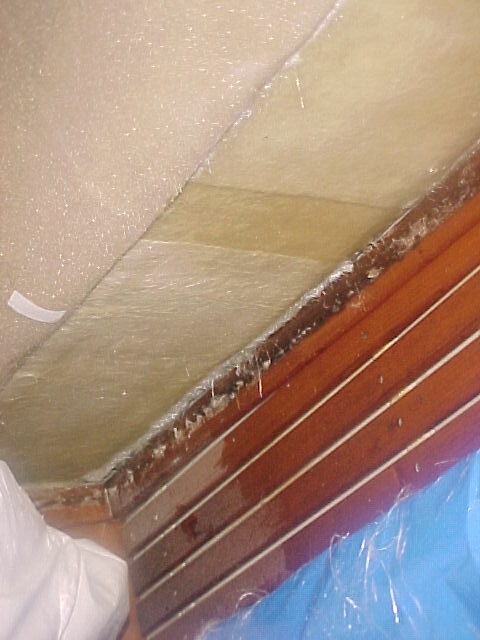 Recently, a prospective buyer was convinced that the flex in the deck was a sign of deck delamination and core deterioration. 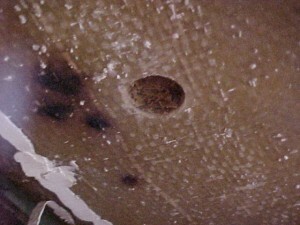 Within days, a fiberglass expert was called in to assess the situation. 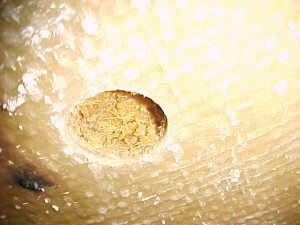 Several core samples were taken on each side of these areas, which concluded that there was no delamination or core deterioration. 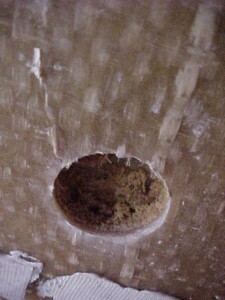 However, the thickness of the fiberglass and core on these sections of the side decks was relatively thin, approximately ½”, which was surprising because when installing a cabin top head vent, chain deck pipes, and the cockpit hatch, the core samples were much thicker (3/4” – 1”). The approach taken for this project was to remove the interior layer of fiberglass and reinforce the side decks from the underside. 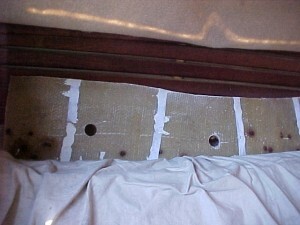 This approach was made much easier as the result of the removable Spectropile headliner that was installed (see recent Gracie Emmett headliner article), and the fact that there were no interior built-ins that had to be dismantled. 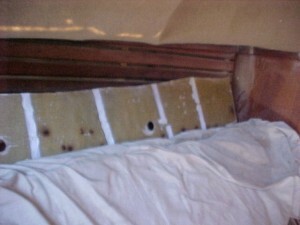 Step one was to cut and remove the interior layer of fiberglass below deck. 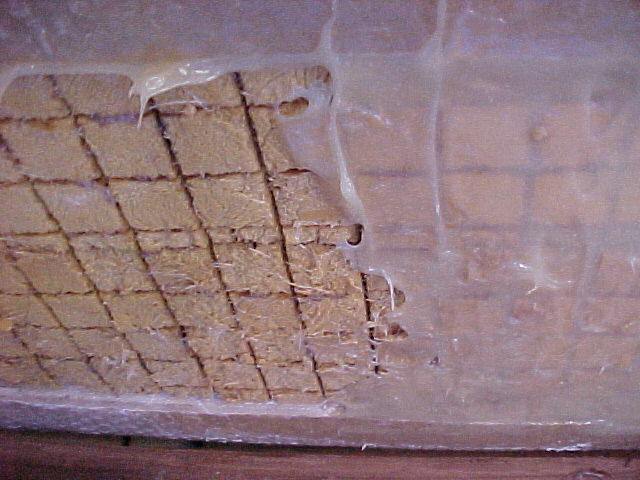 After the interior fiberglass sections were removed, one coat of 1:1 epoxy putty (Superbond Epoxy, Part #s 125324 and 125516, from Fiberglass Coatings, Inc.) was applied to the entire exposed core, taking the time to work the putty into the scores and filling any indentations. This first coat was allowed to cure, and a second coat of epoxy putty was applied, after grinding the surfaces of surrounding fiberglass and putty. Then the first layer of fiberglass mat, wetted with 1:1 resin (Laminating Epoxy Resin, Part #s 125461 and 125229, from Fiberglass Coatings, Inc.), was laid directly on the second coat of epoxy putty. 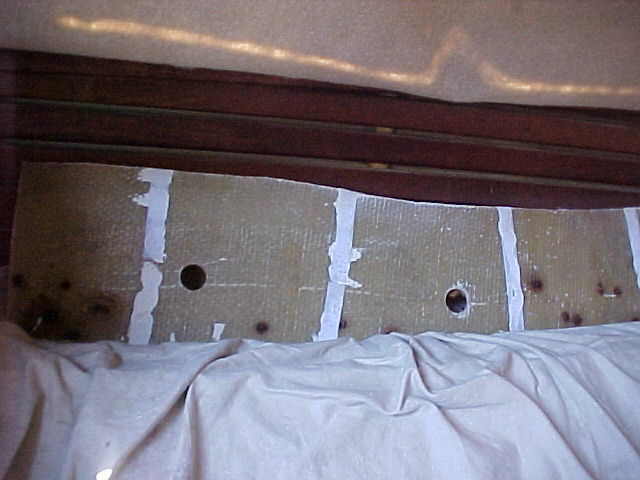 Then, three overlapping layers of fiberglass mat was laid, with an additional layer of mat laid at each of the end sections. It took approximately 2 hours to cut and remove the fiberglass section from the interior (most of this time was devoted to clean-up). It took another 2 hours to apply the first coat of epoxy putty directly to the exposed core. 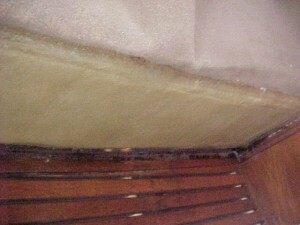 Applying the second coat of epoxy putty and the various layers of fiberglass took two workers, 7 hours to complete. 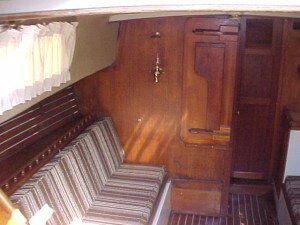 Then it took another 4 hours to thoroughly clean the boat interior. 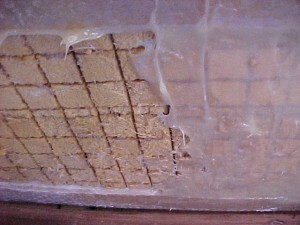 The result was excellent. After the first coat of epoxy putty had cured, the flex in the side deck was eliminated. 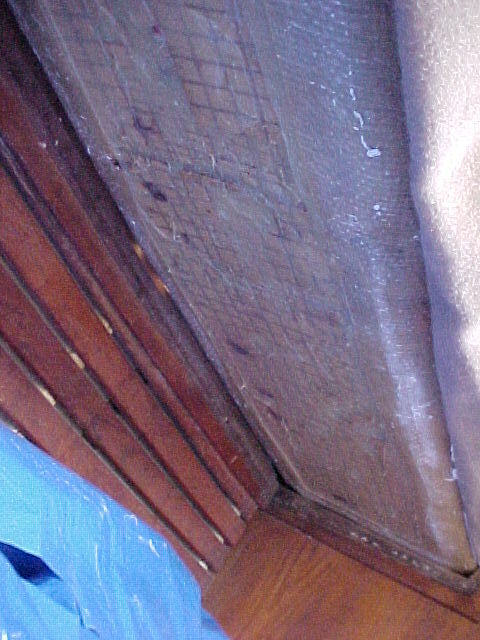 The finished project completely restored the structural integrity to the side decks, and provided an opportunity to thoroughly inspect the condition of these areas, removing any doubt as to the condition of the side decks. Finally, instead of using 5200 caulk and stainless steel staples to secure the Velcro strips used to reattach the Spectropile headliner material, the Velcro strips were embedded with epoxy putty, which was much easier and cost/labor effective. 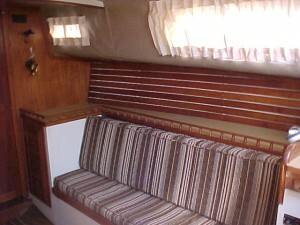 A good old cruiser just got better!